The Last of Us trophies guide lists every trophy for this PS3 action-adventure survivor-horror game and tells you how to get and unlock them. There are 24 Trophies (1 Hidden) that can be earned in the PS3 version. Earn Bronze (7), Silver (9), Gold (7), and Platinum (1) Trophies to increase your Gamer Level. Tip: To find all 30, check out our The Last of Us Firefly Pendants Locations Guide. Tip: To find all 14, check out our The Last of Us Comics Locations Guide. Tip: To find all 85, check out our The Last of Us Artifacts Locations Guide. Tip: To find all 12, check out our The Last of Us Training Manuals Locations Guide. Accomplished by gathering all the Firefly Pendants, Comics, Artifacts, Training Manuals, and weapon upgrade Tools. Here’s a display of how to craft every craftable item. Tip: To find all 13, check out our The Last of Us Shiv Doors Locations Guide. Tip: To find all 5 weapon upgrade Tools, check out our The Last of Us Tools Locations Guide. Tip: To find all 37 required chat locations (out of a 100+ in the game), check out our The Last of Us Optional Conversations Locations Guide. Tip: To find all 5 joke locations, check out our The Last of Us Ellie’s Jokes Locations Guide. Special thanks to Sony & MrReign for the tips and guide videos. 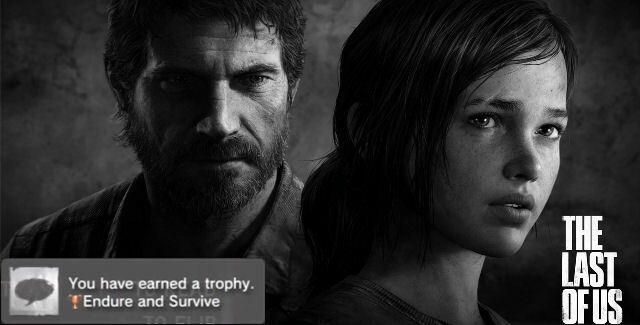 Please comment if you have any The Last of Us trophy unlock tips of your own. Kudos will be given. – Thanks for visiting!